Every time I begin to write about Without Commercial Interruption (on view September 2 – October 30, 2016 at Waterloo Arts), I find myself whirling in the bottomless pool of the exhibit’s context– a racially inequitable society. So I’ve started this at least half a dozen times. 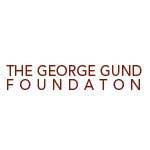 I’m a middle aged white guy, and for me to talk about art that confronts the economic and social disparities between races (which people like me have built for centuries) is to go swimming in reports of black boys and men being killed by police, drug arrests of Black people in numbers wildly disproportionate to the population, and inequity in every corner of life and society I dare to explore. 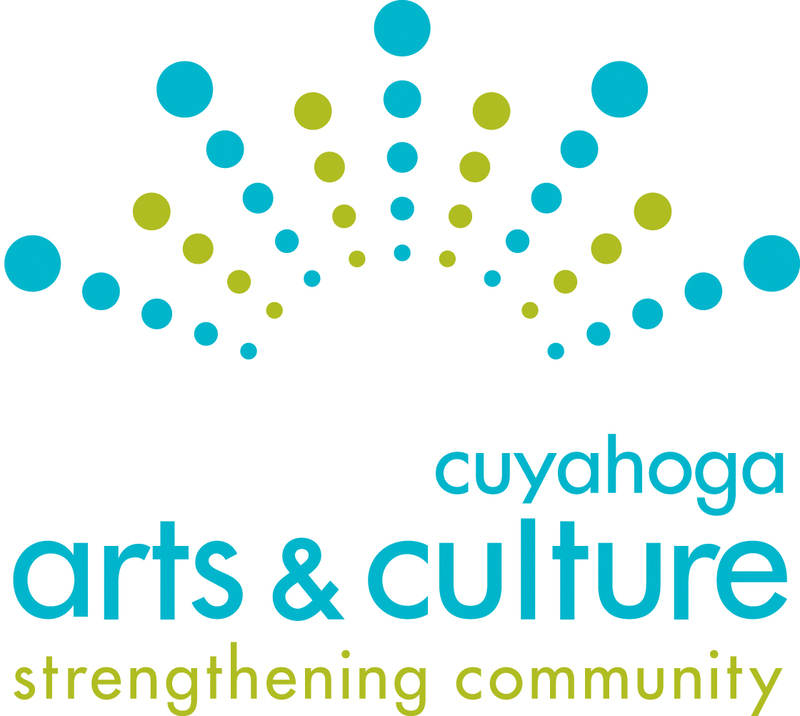 Including Cleveland’s overwhelmingly White art scene. And all through the pool are people explaining why it is this way—why policemen firing guns at unarmed black people are justified, and even myself trying to work through why there are not more African American-owned galleries, especially in neighborhoods like Waterloo. Without Commercial Interruption is an exhibit of works by Donald Black Jr., Amber N. Ford, and Martinez EB, and it takes up all these issues-not subtly, but in stark, overtly stated terms. But let’s go back a few months. It was an especially important moment on Waterloo last Spring, when Waterloo Arts hooked up California artist Desi Mundo with a wall on the commerial strip there, and the artist painted a mural marking the death at the hands of police of Timothy Russell and Malissa Williams, including the 137 unanswered shots the police fired. The neighborhood erupted, in the galleries and in social media, with discussion of what the mural meant to the neighborhood and the businesses there: Was it good art? Was it good because it acknowledged concerns of poor, Black people in a neighborhood where mostly poor, Black folks live? Would it frighten the tourists? Would it alienate the police? Was it “appropriate?” Should it stay, or should it go? The dialog surrounding that mural—which was part of the motivation for this exhibit–was especially important because Cleveland’s art scene thrives in impoverished neighborhoods like Waterloo, where space is cheap. In practice, that has meant that it thrives when White people who have enough money and connections to take advantage of cheap real estate use that position to build gallery careers within those inexpensive walls. The people we see strolling the galleries along Waterloo (or in any other gallery scene here), are overwhelmingly White. And so are the people who run the galleries. And with a few exceptions, so are the artists on the walls. The mural opened the door to talk about this, and the impact it has on neighborhoods and race relations. Without Commercial Interruption continues that discussion about power and prejudice and fear as they play out between races. And of course the artists in this show are trying to make their way in the art world described above. Institutional racism is a common denominator among the three artists. The title . . . Without Commercial Interruption . . . is taken from the landmark spoken word piece by Gil Scott Heron, The Revolution Will Not Be Televised. 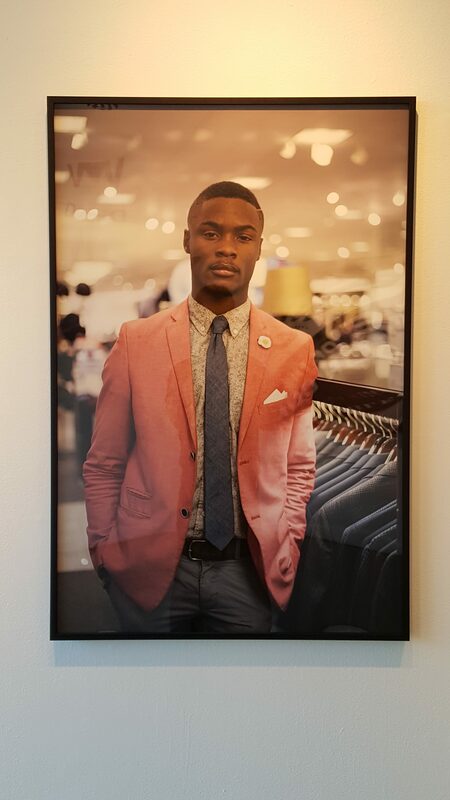 To a degree the show is about how race-based assumptions are packaged by the media and by commercial forces, and about the role of media and consumer culture in perpetuating the situation. To a degree, TV and social media coverage are yet another thing this revolution has to fight against–the packaging, the story tropes. It’s also about violence and fear. You could talk about these works in terms of aesthetic and technical issues, but to do that alone would short change their urgent content. One technical note that has to be made, though, is that all these works make good use of their media, connecting the material to its content with technical skill. 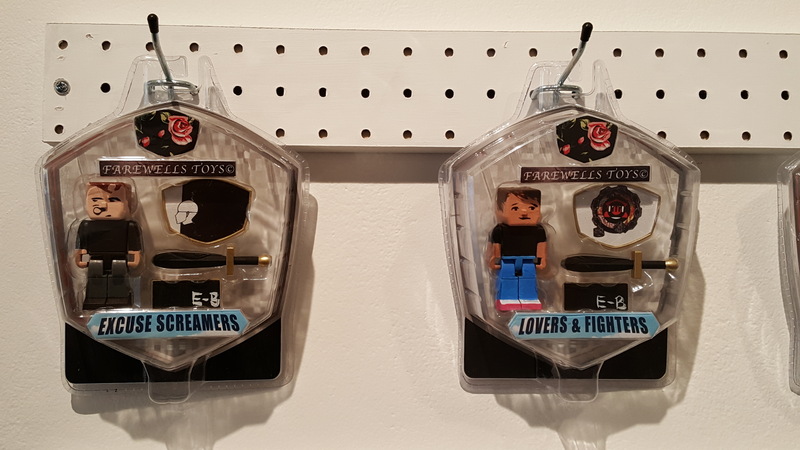 The most witty example of that is Martinez E-B’s re-use of plastic clamshell packaging and Lego action figures, re-cast as characters in the drama that plays out when the police kill an un-armed Black man. 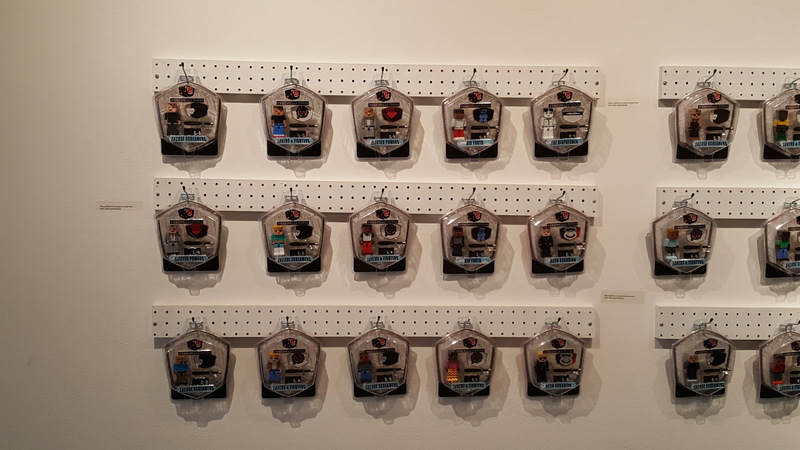 The packaged figures are installed in a matrix on the wall, just like in the aisles at Target. You could collect them all. There are the Dispatchers, who take the calls –for example, the one who answered the phone when a young black man, a boy, really, was waving around a gun—which might be a toy—near the Cudell gazebo. Among the other action figures are the Excuse Screamers, who in the wake of the shootings explain why it happened, and why you “can’t really blame the police officer for shooting.” Then there are Kid Youth, the Elected Powers, and Hush Guardian. All of them play their parts in a concerto of inaction or ineffective response. The installation is a parody of society, of the actors and the responders, their roles so predictable and consistent as to be packaged for replication like toys. You wouldn’t call this a hopeful part of the show. confronting or being confronted or engaged in sporting wizardry—just guys in their element—when the viewer realizes that with a few relatively recent exceptions we don’t really see a lot of that, the photos have done their job. 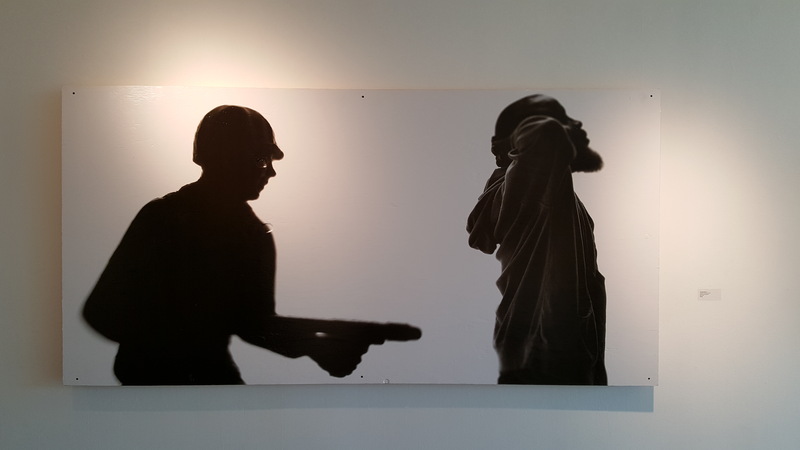 The images are unusual in this room, too: In this show, these guys are surrounded by the forces that make those photos unusual—a context of violence and excuses. 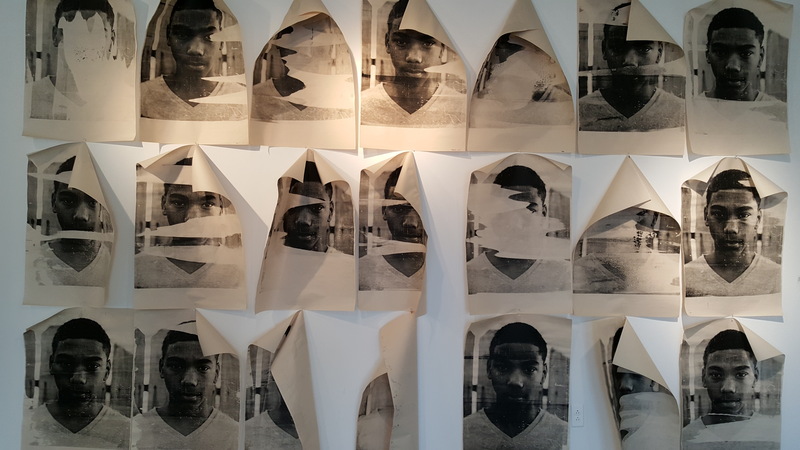 Another of Ford’s pieces dominates the back wall of the gallery, a matrix of poster sized images of a young Black boy, screened on news print, some of the prints with blank streaks, leaving the photo incomplete. Like a life ended too soon. The boy is a relative of the artist, but of course it could be anybody’s brother or son. The piece is called “not enough ink,” which is to say there is not enough discussion, not enough words written about, not enough attention paid to the tragedies we’ve seen unfold, or the challenges boys like this one will face. 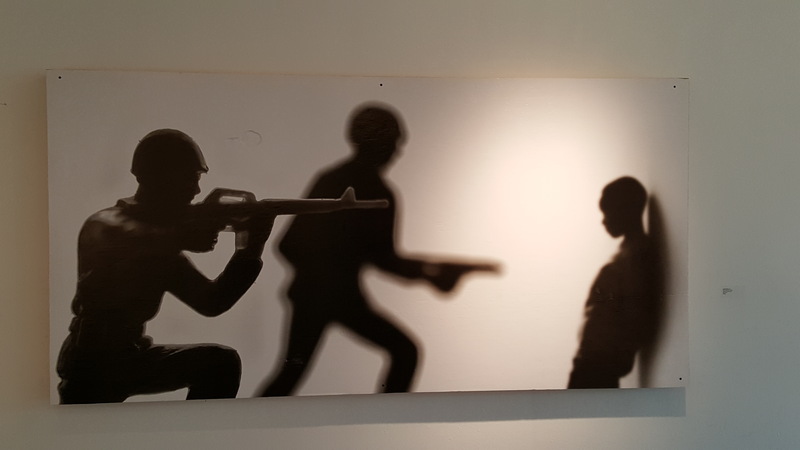 Jr has portrayed confrontation literally, but with toy soldiers aiming guns at black boys and men. They allude to all the recent incidents in which black men and boys have been shot by police officers. 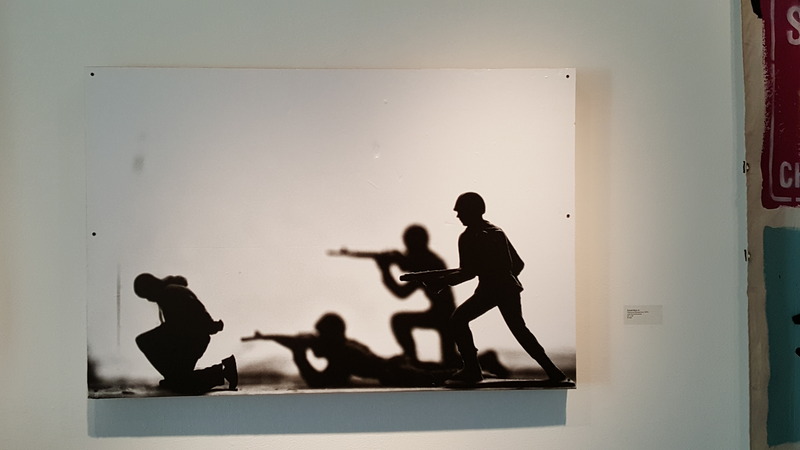 The toy soldiers are up close, so much so that the tiny figures dominate the frames, the edges of the figures here and there buzzing with an out-of-focus blur. And in clearer focus, at the ends of their guns, there are black men and boys, not engaging the fight— hands up, or behind their backs, their backs to the soldiers. In one photo, a young boy is facing the soldiers, backed up against a wall, his hands at his sides. There’s a kind of metaphorical, biographical quality about these. Black says he has been pulled over by police something like 80 times. A significant number of those interactions resulted in seat belt tickets. He continually feels the burden of confronting structural racism, in day to day life as well as on the art scene. 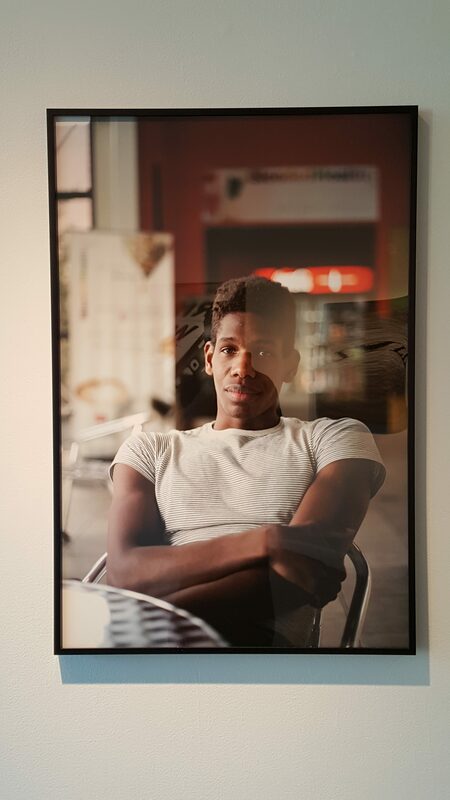 And to me, these photos feel the most personal in the exhibition. moderating and just listened to people talk. People, all of us, have a lot to say, and there will be no end to it any time soon.